I am reminded of the old maximum about pizza; when it’s good, it’s really good and when it’s bad, it’s still pizza. The same can be said for this, the fourth (and most likely final) installment in the ‘Die Hard’ films. It’s ridiculous, loud and obnoxious, but it’s unapologetic in all of this, which is kind of admirable. Bruce Willis again plays John McClane, a New York city police officer, forced to bring evil-doers down almost single-handedly. This time Timothy Olyphant is the villain, bent on destroying the American way of life using an elaborate and perfectly timed attack on the government’s various computer programs. 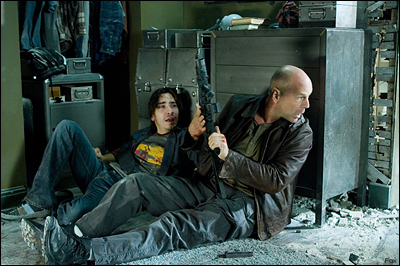 Justin Long, (he of ‘Dodgeball’ and TV’s ‘Ed,’) is the young hacker who McClane must protect for the two-hour length of the film. The first ‘Die Hard’ was a landmark in action films, a new take on an old genre and Willis’ McClane pioneered the wise-cracking protagonist, just trying to do his job and go home at the end of the night. ‘Live Free or Die Hard’ continues the tradition of McClane not wanting anything to do with the action, but being drawn in, but, this time, it all feels perfunctory. He doesn’t want to do this job because he supposed to not want to do this job.